The rain stopped, the sun came out and all around me at the allotment everyone started getting their potatoes in. At the beginning of March. This seems very early to me - this time last year there was snow on the ground. In the three previous years, we've had frosts in April, in London. Just because we've had next to no frost at all this winter so far, doesn't mean there's none to come. 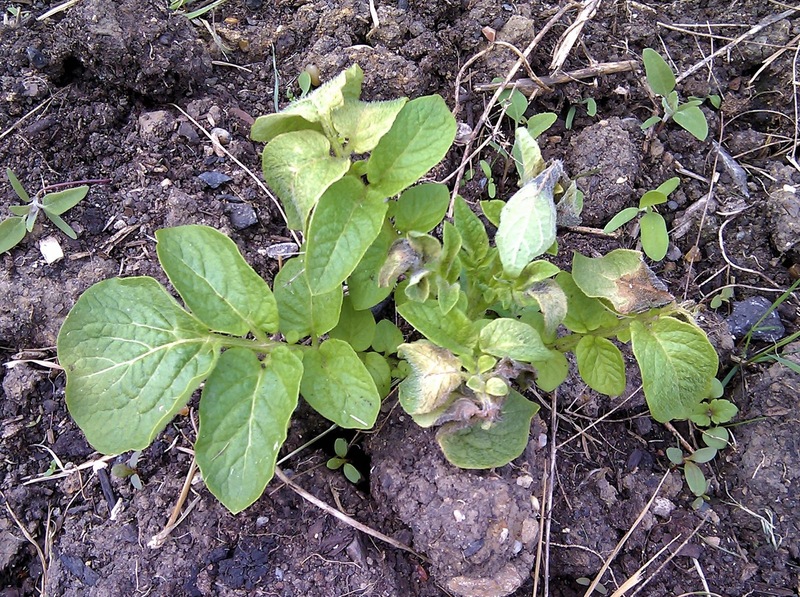 And while potato tubers in the ground are protected against a light frost, the stems and leaves, once they develop, are very vulnerable to even an air frost as I've discovered to my cost more than once. 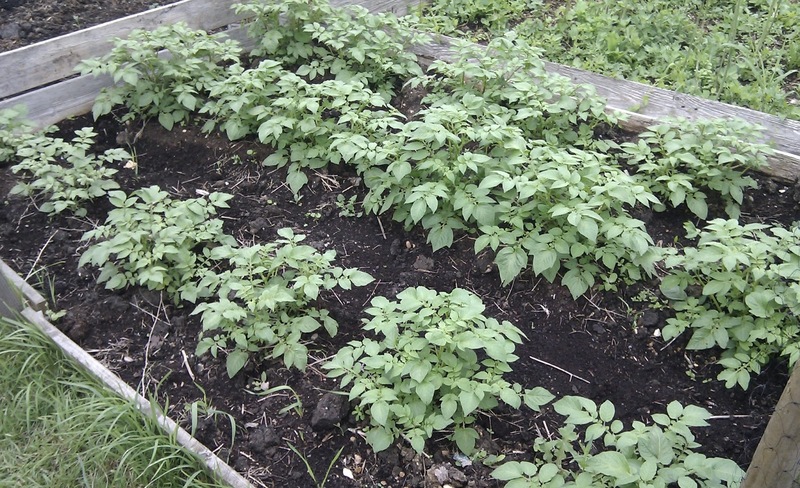 Lady Christl potatoes, planted in the third week of March, damaged by frost in April. This plant recovered - 2-3 others were lost completely. Potatoes (along with tomatoes, now I come to think of it) seem to attract more than their fair share of folklore about the best way to cultivate them. There are people who swear by planting potatoes on Good Friday. This would make more sense if Easter didn't move. This year, I might well plant some potatoes over Easter weekend, but they will be the last lot to go in, the maincrop Pink Fir Apples which won't be harvested until late August. The earlies will be planted around the end of March, weather and temperature permitting, and the ground covered with straw. Any sign of a cold snap coming and the fleece goes on. Then there's the old canard that growing potatoes in a new bed will break up the uncultivated ground. I've long argued this one. 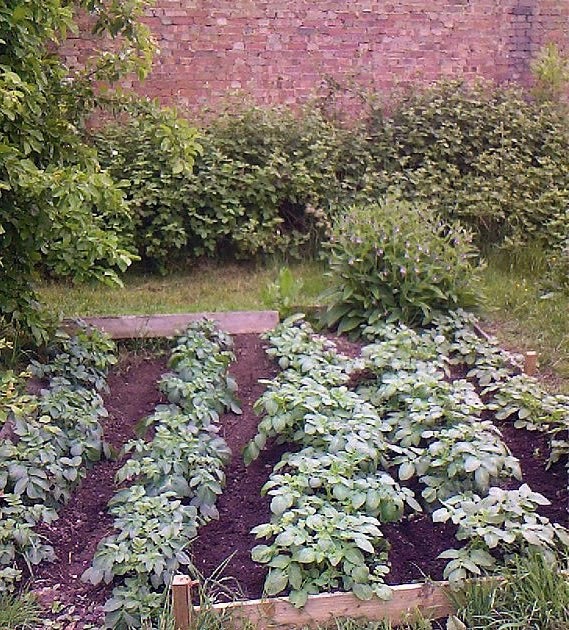 I don't dispute that potatoes can be a good crop to grow in a new bed since the bed will get well and truly dug over (although it's also said that eelworm is more prevalent in uncultivated ground), but to my mind there is nothing magical about the potato itself that breaks up the soil and makes it workable. It's all down to your hard work. First you dig the ground over, then you dig a trench to a depth of six to eight inches, plant the potatoes, cover with soil and possibly some organic matter mixed in, then as the haulms grow, you rake or hoe up the soil to earth them up. No wonder the soil gets broken up. Earthing up. I sure I read somewhere that Hugh Fearnley-Whittingstall doesn't bother. I get lazy about it too. Covering the stems can protect against late frosts (see above) and keeps the growing tubers in the dark, so that they don't turn green and toxic. But sometimes drawing up the soil can be hard work, especially if it's the first year the bed has been cultivated. Most years, I earth up somewhat perfunctorily to start with and then top up by piling organic matter over the plants: straw, leftover compost, grass cuttings - grass cuttings work particularly well because the lawn starts to need regular mowing at the same time as the potato plants put on a growth spurt. The job is done - stems protected, tubers kept in the dark - and the organic matter then acts as a mulch to enrich the bed for the next crop. Using straw to help earth up the potatoes. I've often been told that you should harvest potatoes once they're in flower. Possibly, if you want potatoes the size of a grape. I've found that external signs - flowering, the plant yellowing and dying down - can be unreliable. Plunging your hand in to check the size of tubers works better for me (and is another reason for not earthing up obsessively), and yes, I usually tentatively try this for the first when the plant is in flower. 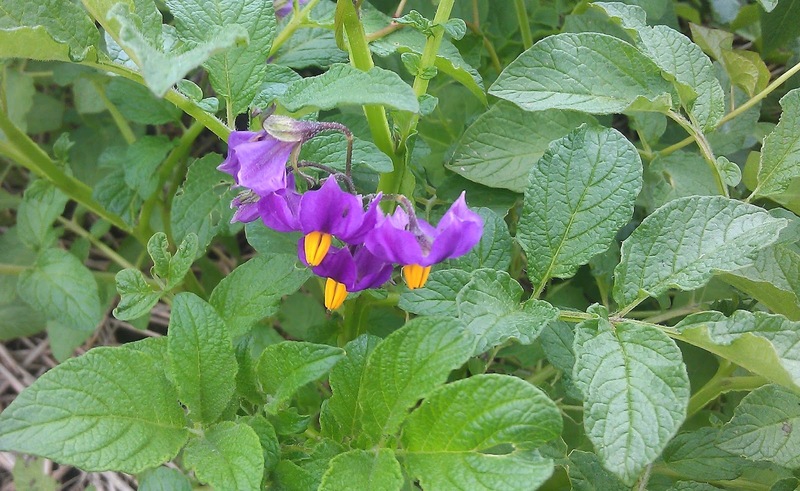 Mayan Gold potatoes in flower - but probably not yet ready for harvesting. Of course potatoes don't have to be in the open ground at all. You see bespoke potato cultivation sacks for sale in Sunday supplements and garden catalogues, but to me this is another piece of unnecessary advice. If you are going to grow potatoes in a container, a black-lined binbag will do just as well - see here for details. Charlotte potatoes growing in a black binbag.